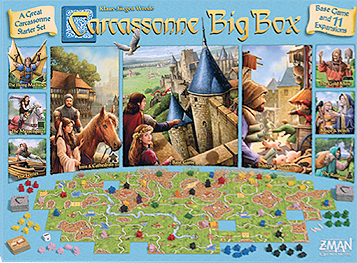 The Carcassonne Big Box combines the 2001 Spiel des Jahres with 11 of it expansions: the perfect starter set for Carcassonne fans and anyone who wants to play this bestselling game with as much variety as possible. All expansions can be played in any combinations, ensuring a unique experience each time you sit down for a game. The base game features everything you need to play the classic Carcassonne experience. Using the game's signature square tiles, you'll discover a landscape of cities, monasteries, roads, and fields. Place your meeples as knights, monks, highwaymen, and farmers to expand your influence and score as many points as possible. Use your meeples wisely however, the player to do so will most assuredly win the game. Increase the value of your cities and roads but only if you can finish them. Large meeples can tip the majority in your favour when you need it most. Eager traders engage in fierce competition to acquire goods from the cities. Builders allow you to play two turns back-to-back, while pigs increase the value of your farmlands. The abbot enjoys both his quiet work in the monastery and tending country gardens. While you can place the abbot on either, you can also remove him early to score points. The river flows through the landscape of the realm, offering new challenges and opportunities. Humanity has always been fascinated by flight. Your meeples can now soar into the sky, though you never know exactly where they might land. The king dispatches his faithful subjects into the realm. Wealth and prestige awaits any who make wise use of these messengers. Powerful magicians visit the realm of Carcassonne. The mage's presence inspire the citizens, but the witch casts a sinister pall over everything she touches. Tobbers on the road demand tribute from wayward travellers. When your meeples score points, another player's robber may steal a few of them from you. Mysterious circles appear in the fields of Carcassonne, holding a strange power over the knights, thieves, and farmers of the realm. This review I provide is for the Carcassonne Big Box that I purchased from Spirit Games a few years back, mine came with the basic game and 4 of the expansions. I can honestly say that this is a really good game - its a European "worker placement" game. The idea is that you place tiles down on each turn and place your allocated workers down in order to score points. The aim of the game is to have more points than your colleagues. Its very strategic, when I first heard someone describe this I honestly thought that it sounded really boring but I actually found it to be anything but boring. If you like the worker placement type games then I would definitely recommend this to you to add to your collection. MrEvilSoupdragon and I have had many hours of fun with this.